It was so fascinating to observe the monks. They live a vow of poverty so no luxury is being enjoyed. They have to ask alms from the people in the community for their group’s subsistence. Prior to living the religious life and following the monastic discipline called Vinaya, one has to undergo a novitiation ceremony. As we ascended the topmost part of the Shwedagon pagoda using the long escalator and stairs, we meet a group of people going down who seem to be in a celebratory mood. There were three men carrying three individual boys in a decorated costume, leis, headdress and an umbrella. They were also made up yet with red lipsticks. I ran to find out what was the ceremony all about and was revealed to me that the boys were baptized to become monks. 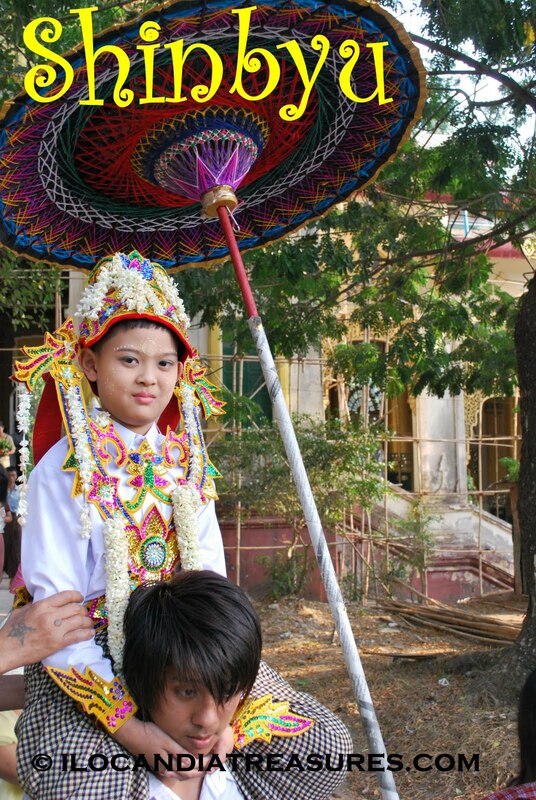 A special rite of passage called Shinbyu is celebrated by many Burmese boys when they enter the monastery for a short time as novices or monks. The parents of boys really make it appoint that at their son’s age of 7 or older, they are admitted into Buddhist Sangha by performing this ritual ceremony. Shinbyu has a symbolic procession and ceremony of exchanging royal attire with that of an ascetic. It follows the historical Buddha where he was born as a prince but left the palace to find the Four Noble Truths and achieve Nirvana. The boys are expected to stay at the monastery for the Buddhist teachings for a few weeks or longer. They can return when they reach the age of 20.